I have to admit, I am a little obsessed with this Mandala® Yarn by Lion Brand. * So far I have made a triangle scarf using a pattern by Jess over at The Make & Do Crew. You can make it in two sizes and it really looks stunning when done! I made mine using Mandala Yarn in Wood Nymph which is a nice blend of lavendar, fuschia, pink, purple, lilac and cream. Jess also has a great video tutorial of her pattern in action. If you like to learn by watching then this tutorial is perfect for you. Just scroll down in her post to find the video. If you have not used the Mandala® Yarn by Lion Brand yet, please check them out. There are 25 different color combinations to choose from! The yarn is easy to work and I love how you can get a ton of different colors without having to change colors. I like to play around with the color ways as well. For instance, on this scarf I moved a couple of the colors out of order from how they came on the skein and I also removed one of the colors. I wanted a little more symmetry in the ends of the scarf so I moved one of the purples to be at the end as I was working. There was also a really bright pink which I did not want to incorporate into this scarf so I just removed it completely. You can play around with the color combinations like I did, or use them as is. You can also add tassels or fringe to this scarf. I added small tassels. This scarf is for sale in my Etsy store here. Just click on one of the piectures above to check it out. Or, give it a try yourself and let me know how you did! 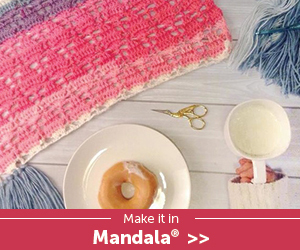 Check out my newest scarf using Mandala® Yarn — Shades of Sherbert! *Disclaimer: Please note that some of the links above are affiliate links, and at no additional cost to you, I may earn a commission if you decide to make a purchase after clicking through the link. Please understand that I have direct knowledge and experience with any of my companies, and I recommend them because they are helpful and useful and I truly believe in them. The opinions expressed in this post are solely my own.